Reticulated pythons (Python reticulatus) are massive reptiles that hail from the southeastern region of Asia -- think the Philippines and Indonesia. Out in the wild, they often spend their days in damp rainforests and marshes. When they're kept as exotic pets, they instead spend their time in comfortable homes. As far as lifestyle goes, reticulated pythons are pretty independent creatures, as is true with most snakes. These sizable snakes are brownish to beige in coloration, with elaborate pale brown spots and elements of yellow, white and off-white. The brown spots are usually divided up by black or deep brown borders. The reticulated python coloration is a form of camouflage that helps them remain low-key amidst piles of foliage on the ground. The more inconspicuous they are, the more stealthily they can be while on the lookout for prey. These carnivores consume meats galore in the wild, whether birds or mammals. As pets, they consume similarly meat-packed diets. Reticulated pythons boast the distinction of being the biggest pythons on the planet. Fully mature individuals in optimal living conditions generally can get to anywhere between 22 and 26 feet long. Weight-wise, adult reticulated pythons also tend to tip the scales anywhere between 200 and 250 pounds. In extreme cases, these pythons can even surpass 33 feet long, but just by a tad. Because of their length, cage size is an extremely significant consideration. 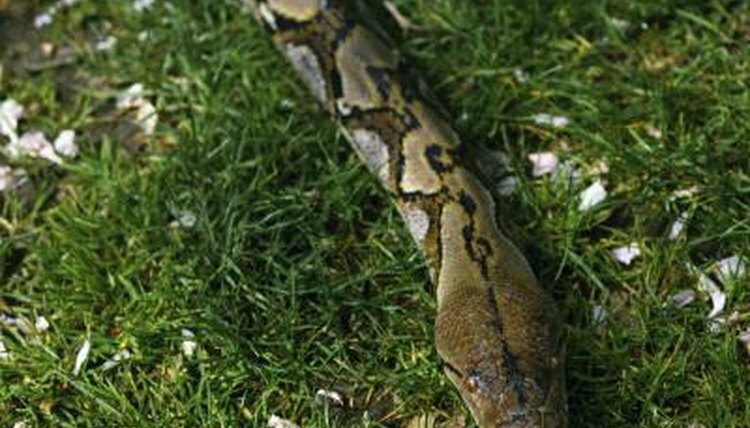 Reticulated pythons usually are speedy in the growth department. In maturity, these snakes generally can manage well in cages that are between 6 and 8 feet in length, around 3 feet wide and 2 feet high. If your pet is on the bigger side, you'll want to increase your cage size. Bigger specimens might need a length of 10 feet, width of 4 feet and height of 3 feet. If you have any specific concerns regarding the most suitable cage size for your snake, consult a veterinarian that specializes in reptiles. A spacious cage is of utmost importance to reticulated pythons. They require lots of room to stretch. It is crucial for them to be in environments that promote not only stretching, but also motion in general. Mature reticulated pythons tend to appreciate roomy environments. When they have lots of room, they often make the most of it by roaming around. If one of these reptiles lives within an overly tight setting, it could harm his health -- and maybe even limit his remaining lifespan as your pet. Don't take the issue lightly.